The Flippers are the only real interface to the game: You manually activate a switch that fires a solenoid, which then drives the flipper mechanism… The issue that becomes apparent with Flippers is that you want high-power (and high current) when you’re hitting the ball, but you don’t want to burn out your flipper coils if you hold the buttons too long. These problems have been solved during the long evolution of Pinball, with somewhat complicated results. 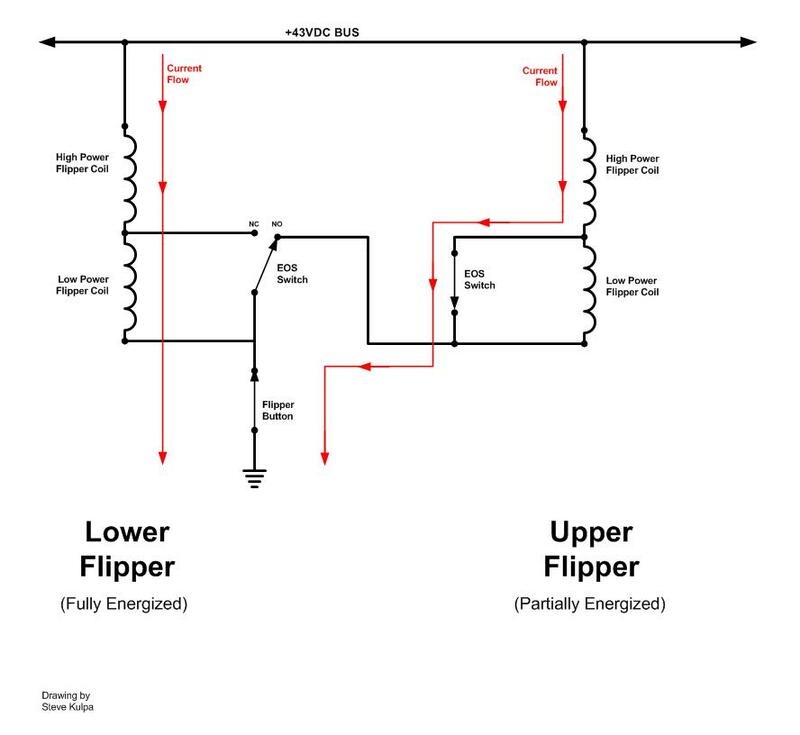 It’s understandable that there are often questions about connecting and firing Flippers; With their double-wound coils, multiple recirculation diodes, and end-of-stroke (EOS) switches, it’s easy to get confused if you’re hooking them up for the first time. And to make things more complex, today’s modern control systems have the ability to do many more things, like fire the “power” and “hold” coils independently, apply “patter” to the coils, feed the EOS switch into the controller as a normal switch, or even bypassed it completely. Typical vintage circuit for enabling pinball flipper mechs. Typical End-of-Stroke switch setup and function. In the above diagram, the EOS switch is Normally Closed (NC) before activation. The switch is shorting out the “Hold” coil, which is a higher resistance and would otherwise limit the current. 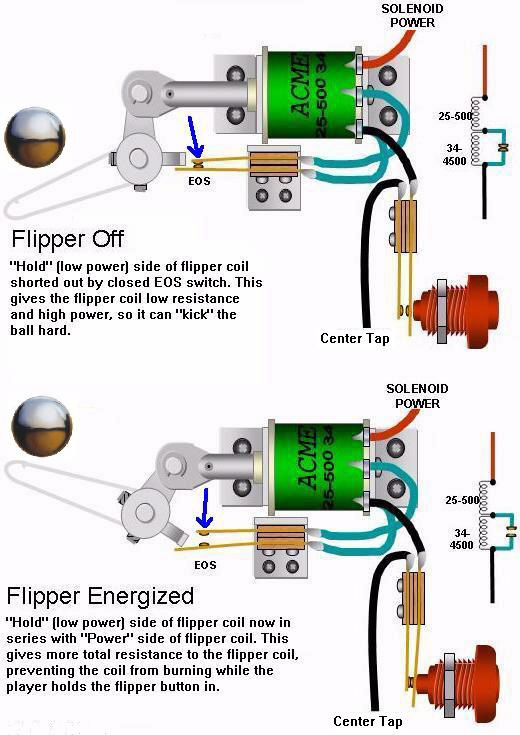 One the Flipper has reached full stroke, the EOS switch opens, adding the “Hold” coil to the circuit. 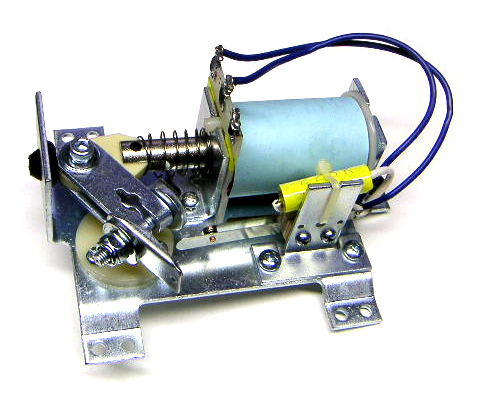 This reduces the current while maintaining enough of an electro-magnetic field to keep the solenoid in position. On a side note, the typical convention for labeling coils is to indicate the wire gauge, followed by the number of turns. So “25-500” is 500 turns of 25Ga magnet wire. 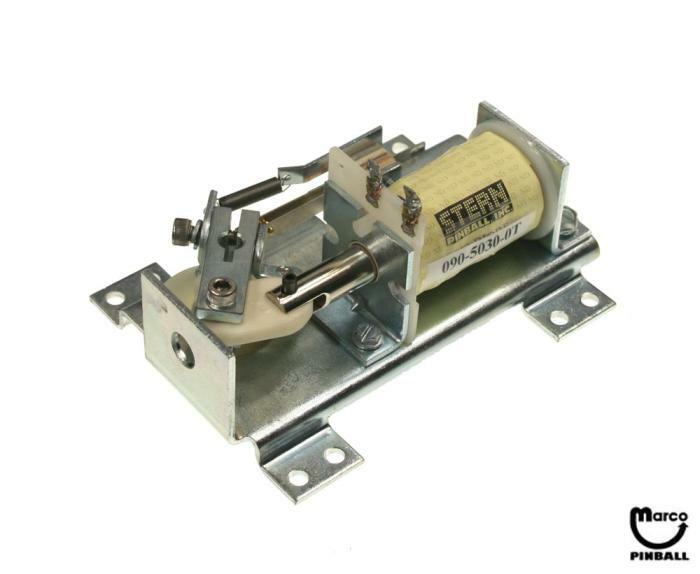 The hold coil is labeled “34-4500”, so 4500 turns of 34Ga magnet wire. Low gauge is thicker wire, with less resistance and higher current carrying ability. Resistance also increases with length. So more turns at a higher gauge will yield a much higher resistance than fewer turns at a lower gauge, even if the same amount of copper is used. 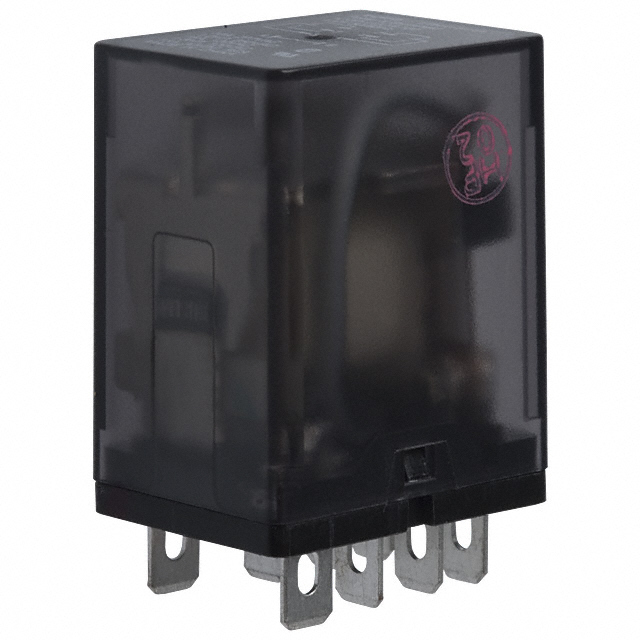 Standard K10 form-factor relay, DPDT suitable for pinball. Typical K10 relay socket with terminal connections. You have a couple of options in wiring up this circuit. I like to have the relay on the high-voltage side of the flipper coils, and use the cabinet buttons to switch the ground side of the coil. Zero latency from button push to firing the flippers. And, only one solenoid driver channel is used, just for the relay. 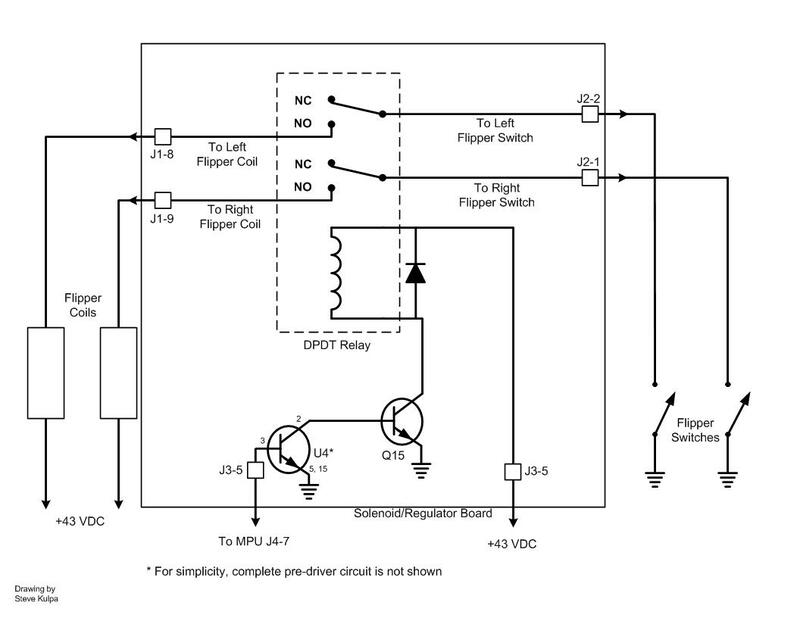 As simple as the circuit is, it can be a lot of wiring to get power, ground, buttons, flippers, and solenoid driver lines all to a central relay. Power of the flippers are not independently adjustable. Staggered firing of multiple flipper coils using the primary EOS switch, reduces surge current. It’s much easier to wire flippers directly to the driver, and have cabinet buttons go to the controller. I currently have two Custom Pinball Machines wired this way, and I can see how the ease of wiring justifies the downsides. Plus, you have full control over flipper power, and could even manipulate the power as part of the game rules. Having the Flipper buttons sent to the controller, and then the controller signal sent to the driver, can introduce latency (that is, a significant delay between pushing the button and seeing something happen). This is by far the most commonly cited disadvantage. However, I can say from personal experience that it’s barely noticeable (or not detectable at all), even with a relatively low-speed controller like an Arduino. With that said, there are other potentially more critical disadvantages… Eliminating the EOS circuit is not “Fail Safe”. Having the high-power coil under computer control could lead to problems, especially during development and testing, or as a machine gets older and less reliable. Another disadvantage is that configurations firing two coils per Flipper (independant “power” and “hold”) can eat up available driver channels pretty quickly, especially on multi-flipper games. But this would only be a corner case where the EOS switch was eliminated, while retaining the “hold” coil (as in situations where PWM “patter” drive is not an option). Reproduction Bally Flipper Mech available from Pinball Life. Typical switching power supply suitable for Custom Pinball. 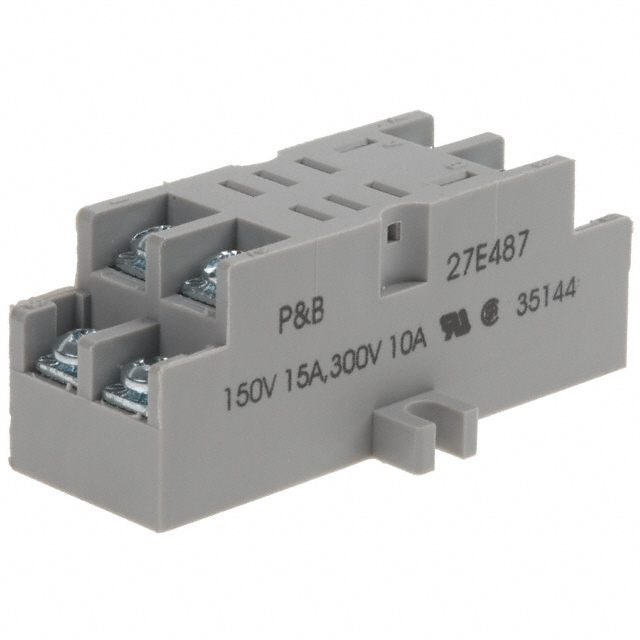 Obviously both made by Lamda, one is 36V nominal for solenoid coils (32V – 40V adjustable) at 4.3A output, and the other is 5V nominal for lighting and control electronics (4.7V – 5.5V adjustable). 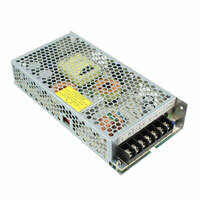 These are typical closed-frame power supplies used in industrial equipment. I usually set the higher voltage supply to about 38V, which is plenty for flippers, and can drive the heavier loads like resetting drop-target banks. I also usually boost the lower voltage to 5.5V (or 6V even if you use a different version) to add a little extra punch to the lighting. Most of the 5V components either have their own 5V regulators on-board (and thus may require a slightly higher voltage), or can tolerate a slight boost. Most people now use LED lighting, at much lower currents. Older games with incandescent lights had huge power draws, and required large supplies. General illumination was the main energy consumer in older games. The idea of having lots of continuous current available for driving solenoids is counter-intuitive. Most older machines fused their 43VDC power at 5A max. Having excessive current available only makes it more likely to burn out solenoids (or fuses if you’re lucky). A power-limited supply makes it virtually impossible to burn out a coil. Modern switching power supplies are smaller, more efficient, and not as noisy as their earlier counterparts. In the old days, designers avoided switchers because of conducted noise issues at the high power required for older games. Large capacitors are easier to get these days, and can better compensate for surges that previously had to be mitigated by going to higher power ratings. Buying an off-the-shelf industrial power supply is not only convenient, it can also be cheaper than some of the custom- or purpose-built “pinball” power supplies available, which are usually overkill for what is actually needed.